Toys & Video Games > Barbie Dolls. Item Description This one is one of the most fashionable Barbie and she comes with lot of hair designing accessories that will help the little one to shape her hair as per her choice. Item Description Cute and beautiful looking Barbie in her Pretty 'n' Cool looks, is here to let the little one enjoy Barbie's world the most. 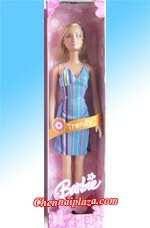 Item Description Beautiful looking Barbie in her Trendy looking Turquoise blue dress, is here to let the little one enjoy Barbie's Fantasy World. 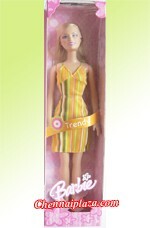 Item Description Beautiful looking Barbie in her Trendy looking Orange dress, is here to let the little one enjoy Barbie's Fantasy World.